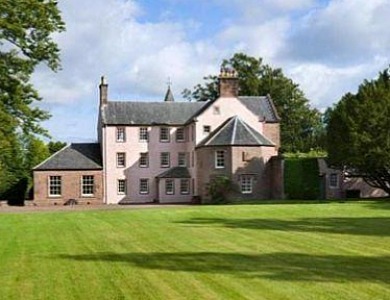 Gilmilnscroft is a wonderful small estate with around 80 acres in East Ayrshire in Scotland. The main mansion house is a traditionally-built Scottish property with extensive accommodation dating back to the 17th century with some later additions. The entrance hallway leads to the elegant drawing room with its bay window and open fireplace and with some notably well-preserved cornicing. The sitting room has twin windows and timber planning, with French doors to the garden, as does the library. The formal dining room features a wonderful marble fireplace with twin sash and case windows overlooking the walled garden; the dining kitchen has a two- oven black Aga. Upstairs are six bedrooms spread between the first and second floor. The master bedroom has a bay window to the rear overlooking the walled garden and a magnificent a stone fireplace with carved initials RF (Robert Farquhar) 1682. On the third floor there are two loft rooms and a loft store. Adjacent to the main house is the stable block which comprises substantial Victorian stables on the ground floor with four stalls, two loose boxes and a first floor flat with open plan living room/kitchen, two bedroom and bathroom. To the rear of the stable block are an office and a potting shed. The land at Gilmilnscroft comprises grazing land and policy woodland. The grazing land is let out to neighbouring farmers for seasonal grazing and the woodland at Gilmilnscroft is largely amenity woodland with a mixture of coniferous and deciduous trees. At the main entrance to the estate is a stone and slate lodge house which currently offers a sitting room, double bedroom, kitchen and a shower room. Gilmilnscroft lies in one of the most unspoilt parts of East Ayrshire, standing high above the conservation area village of Sorn. Gilmilnscroft is in the heart of Burns country in mature grounds and attractive farmland from where there are magnificent views to the surrounding hills. Sorn is an attractive conservation village situated on the River Ayr. Local amenities include the Sorn Inn, a church, a general store with post office, a village hall, a bowling green and a primary school. The guide price is £900,000. For further information please contact Savills on 0131 247 3704 or visit www.savills.co.uk.